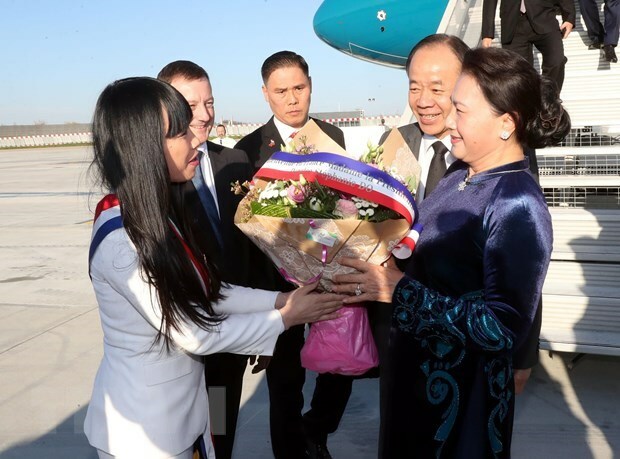 Paris (VNA) – National Assembly (NA) Chairwoman Nguyen Thi Kim Ngan and a high-ranking delegation of the Vietnamese NA arrived at Orly Airport in Paris at 17:25 on March 30 (local time), beginning an official visit to France at the invitation of President of the French NA Richard Ferrand. 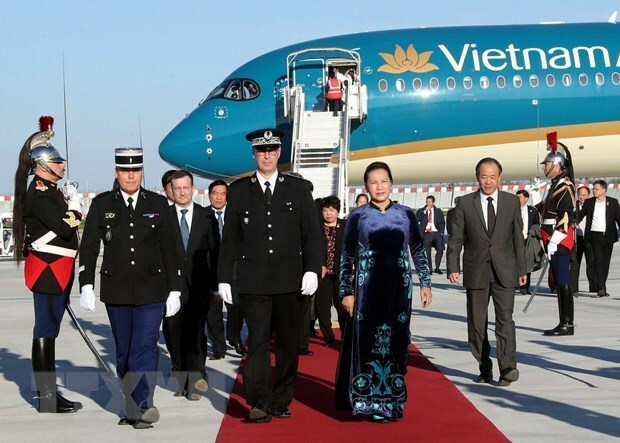 The delegation were welcomed at the airport by Vietnamese Ambassador to France Nguyen Thiep, Vietnamese Ambassador to UNESCO Tran Thi Hoang Mai, representatives of the Vietnamese community and the Vietnamese Embassy in France, President of the France-Vietnam Friendship Parliamentarians Group Stephanie Do and French Ambassador to Vietnam Bertrand Lortholary, among others. Joining the delegation included Chairman of the NA Committee for External Relations Nguyen Van Giau; Secretary General and Chief of the NA Office Nguyen Hanh Phuc; Chairman of the NA Council for Ethnic Affairs Ha Ngoc Chien; Chairman of the NA Law Committee Nguyen Khac Dinh; Chairwoman of the NA Committee for Social Affairs Nguyen Thuy Anh; Prosecutor General of the Supreme People’s Procuracy Le Minh Tri; and many other senior officials. Vietnam and France set up diplomatic relations in April, 1973. The sound political relations between the two countries have been marked by high-level meetings, including the 2016 visit of French President Francois Hollande, and the 2018 visit of Party General Secretary Nguyen Phu Trong. The two sides have maintained many cooperation mechanisms, including defence-security strategic dialogue and an annual high-level economic dialogue. Parliamentary partnership has been growing with regular delegation exchanges and collaboration at multilateral parliamentary forums, especially the Inter-Parliamentary Union. The NA of Vietnam has signed agreements with the Senate and National Assembly of France. The two parliaments have set up bilateral friendship parliamentarian groups. France is the fourth largest trade partner of Vietnam in Europe after Germany, the UK and the Netherlands. The country made a two-way trade value of 5.1 billion USD with Vietnam in 2018, ranking third among European countries. It is the 16th biggest investor of Vietnam with total investment of 2.8 billion USD, and the leading European ODA provider with total committed capital of 3 billion EUR. Education-training partnership between the two countries has developed since early 1980s as France has considered education-training a priority in its cooperation with Vietnam, focusing in teaching and popularizing French, tertiary education and post-graduate education in economy, banking, finance, law and new technology. They have seen progresses in affiliation in science-technology, security-defence, locality-to-locality cooperation, and health care. As members of the International Organisation of La Francophonie (IOF), Vietnam and France have made many collaboration activities within the organisation’s framework. The visit of NA Chairwoman Nguyen Thi Kim Ngan is taking place when the two countries are to organise the 11th conference of cooperation between Vietnamese and French localities.